Today Microsoft announced the availability of Red Hat Enterprise Linux images in the Azure Marketplace. You can now deploy RHEL 6.7 and 7.2 images in all regions except China and US Government. This is a big move for Microsoft and it shows their commitment to the open source ecosystem. Microsoft will offer fully integrated support with Microsoft and Red Hat support engineers sitting along side one another. 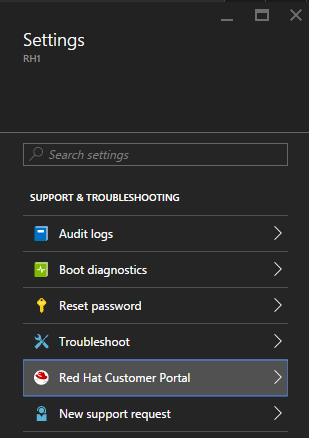 Lets see what the deployment experience from the Azure Portal looks like. You will find the image by clicking on the add new button in the portal. A new blade will open, type Red Hat to search the Marketplace. Here you will see two version to choose from. Select your desired version. Now you can choose your image. A new blade will open, keep the default deployment model set for Resource Manager and select Create. 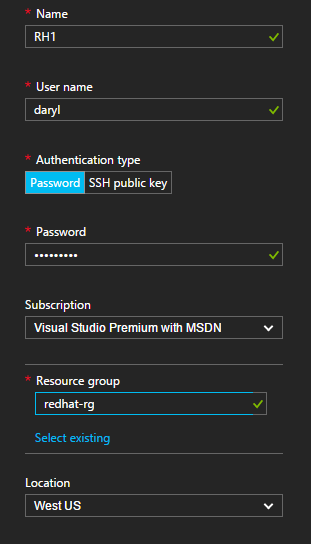 From the Create Virtual Machine blade, first fill out the Basic settings of VM name, User name, Authentication type, Password, Subscription, Resource group, Location and click OK.
Next we need to choose a Size for the VM. Next we need to configure the optional features. You can chose to keep the defaults if you are just testing but you would want to change these to something more meaningful beyond that. Here you can choose the Disk type (standard or premium), Storage account, Virtual network, Subnet, Public IP address (dynamic or static), Network security group, Diagnostics (enabled by default), Diagnostics storage account (if different from blob storage account), and whether you want to use an Availabilty set and click OK.
Review the Summary and click OK to start the deployment. One thing I noticed is there wasn’t an option to not pin the VM to the dashboard. I imagine that this will get fixed soon. 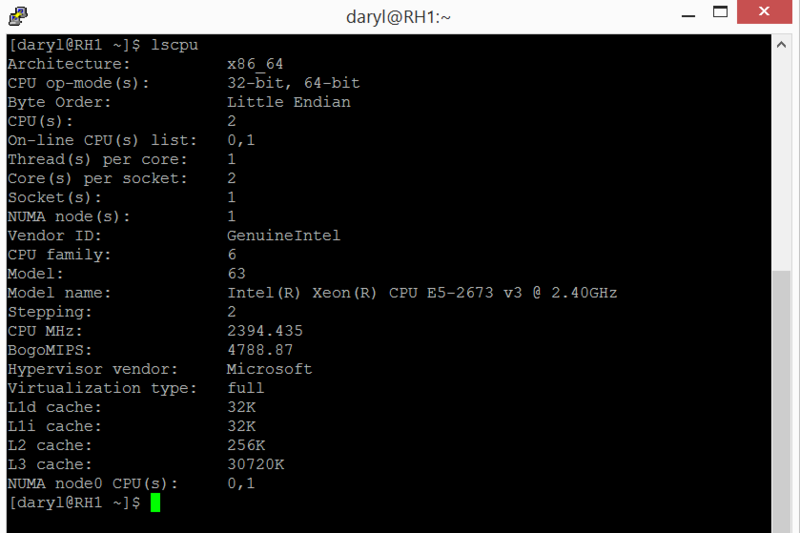 From the dashboard you can just right-click on the VM and choose to unpin it. Allow a few minutes for the deployment to succeed. You can now see a summary of the resources deployed in your Resource group. 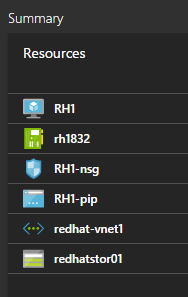 If you click on the VM resource and on the Settings blade you will see a new item called Red Hat Customer Portal which will give you direct access to the portal. To connect to the VM you can use Putty. Enter the Public IP address of the VM using SSH on port 22 and click Open. Login with the User name and Password and you are all set. Here we can see the release info. Now prepare yourself for whats coming next. Viola! Check out the Hypervisor vendor. 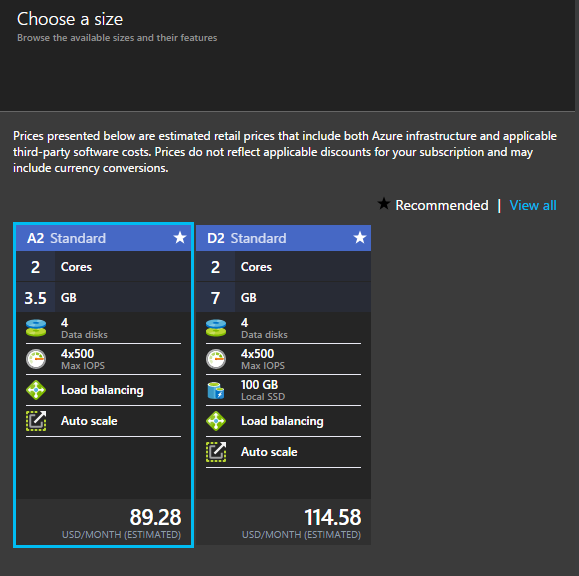 Deploying a Red Hat Enterprise Linux image from the Azure Marketplace is pretty simple so go out there and deploy and have fun.